As a new mom, everyone seems to tell you that “they grow up so fast and to enjoy every moment” while you’re carrying a newborn in your arms. It’s true. Every day is a new adventure as you discover new ways to bond and show your little angel unconditional love. Every new move and discovery is also a discovery for you as a mom. You discover the balance of being their biggest sense of protection, while also letting go so your baby or toddler can explore things on their own. Some things don’t change. At 19 months, the first thing Blake still wants to do when he wakes up is breastfeed. I love the closeness we have when he is nursing. It almost seems like he wants to nurse even more as a toddler. I often get asked how long I will breastfed and my response is usually something like, ” It’s really up to Blake.” I don’t believe in cutting him off when my body is still producing milk and part of me is not ready to let go of this special bond that we share. However, when it’s time it will feel natural to switch to a bottle, or a glass of milk. One of the biggest transitions that we noticed closer to when Blake was 12 months was his new ability to self soothe and sleep through the night. It’s a magical transition, but sometimes it can take work (with us it did). I highly recommend a book that my pediatrician gave me, which guided us through sleep training called “Solve Your Child’s Sleep Problems” by Richard Ferber, M.D. As a result, Blake now sleeps about 10 hours a night and takes about a 2 hour nap daily, waking up with a huge smile on his face. Sleep training is worth it; everyone wakes up happy and rested. For all the mom’s who have babies that are not walking yet, just enjoy this time! Yes, it’s exciting to watch for the first steps, but just keep in mind that once they start walking, they get into everything and I mean EVERYTHING! There is a new level of baby proofing that comes with toddlers, especially if you have a swimming pool. They figure everything out, so its mostly chasing after him and making sure he’s safe. With all of his running around he will bump into things or fall every now and then. I usually respond with something positive like “you’re okay!” so he doesn’t cry every time he stumbles or falls. If he does fall, he will normally get right back up like nothing happened unless he really did injure himself. Something else that I have learned along this new journey is to embrace their fearlessness even when it can be scary (of course go with your instinct on this one). I remember taking Blake to The Little Farm in South Florida at 12 months and they offered pony rides. At first I thought Blake was too young for something like this but he seemed to really want to try riding on one named Salty. So I trusted that he would be okay riding on one for the first time and walked right beside him. He was trying to figure out his balance, sliding a little to the left and a little to the right. Quickly, he figured it out, laughing with excitement and seemed to be proud of himself. It was a beautiful moment. After riding his first pony, he saw a piglet for the first time and thought why not try to ride a piglet too! Haha, he immediately discovered that piglets don’t want a baby riding on them. I explained to Blake that piglets are babies also. As Blake is older now, he is learning to be more gentle with animals and to treat them with love. It’s a work in progress because he gets so excited when he sees an animal so he doesn’t quite understand what gentle petting is yet, but he will get there some day soon. Part of being a mommy is also being extremely patient and persistent in teaching your little one family values with love. One of our daily activities remains constant, from the time Blake was a baby to his current stage as a toddler. We explore nature daily. As a toddler he is more interactive, connected and focused on showing me what he wants to do. Daily, we go outside, get fresh air, and often walk barefoot (at least in St Barth we do). 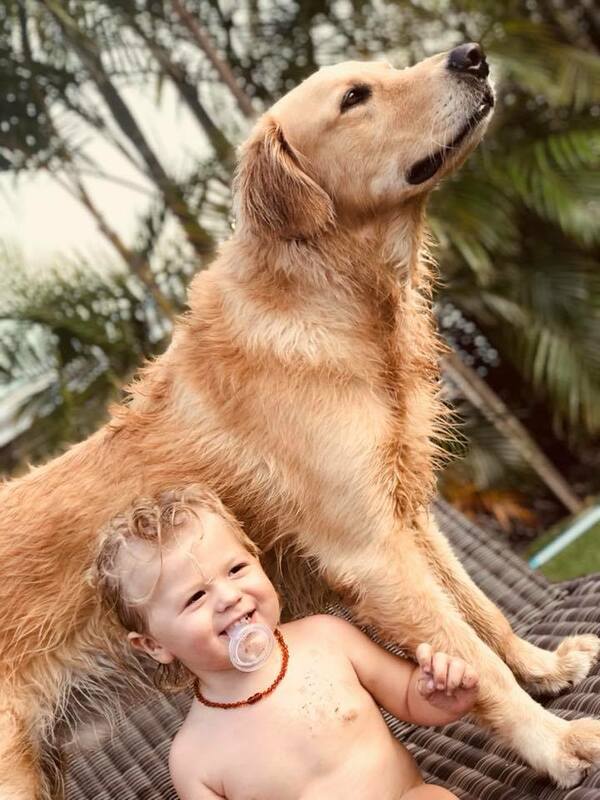 Nature is our favorite playground, being around animals, watering plants (Blake even likes to help pick fresh jalapenos regularly), and putting our feet in the sand or jumping in the saltwater! Blake normally runs straight towards the waves, so I’m always ready to chase after him. (Once he learned how to walk, he went from walking to running right away). The next big question that people often ask at this stage is, “when are you going to have your second one?” Haha, for me I’m still enjoying my first one and maybe one is perfect for me. Blake already has an older brother figure, his name is Kanpai. A gentle, loving golden retriever who we have also raised since he was a puppy. Teaching babies and toddlers to be comfortable around animals and to respect them is so important. It’s amazing raising Blake with Kanpai, they are both learning to be gentle with each other (fortunately Kanpai has been amazing at setting an example of what it means to be gentle even when a toddler THINKS he is petting you). These two are best friends and have such a beautiful relationship. Whether your little one is a baby or a toddler, it doesn’t matter. It’s really about spending quality time with them, spoiling them with tons of love and attention, teaching them core values with positive reinforcement, taking them on adventures and being their role model. Remember, you are everything to them and at the same time they are everything to you. Welcome to this tribe of motherhood, it’s the most beautiful journey I have encountered as a woman. You learn what it is to love in a new way. It’s precious. It’s a blessing. I wouldn’t change it for anything in the world. It’s the biggest gift we can imagine.